Arm your body to scavenge damaging free radicals with the antioxidant-laden SODzyme® with GliSODin® & Wolfberry - 90 Vegetarian Capsules from Life Extension®. As you age‚ your body does not have enough antioxidant enzymes in its own reservoir. Hence‚ you need a supplement to replenish the reserves for self-defense. SODzyme® proprietary phytoenzyme blend comprises corn‚ soybean and wheat sprout concentrate. Being the richest source of plant protein‚ soybean appears to have amino acids and peptides aplenty. It scores high in terms of antioxidant benefits due to the presence of genistein. This component boosts the activity of enzymes like superoxide dismutase‚ catalase and others. GliSODin® in this dietary supplement from Life Extension® is also obtained from plants and appears to augment superoxide dismutase and catalase levels. Alleviating oxidative stress‚ it may boost cellular health and promote immune response. Studies reveal that wolfberry (Lycium barbarum) is loaded with nutrition‚ which include vitamins A and C‚ beta carotene‚ lycopene‚ thiamine and antioxidants. These berries may help prevent the formation of oxidative stress and fight damaging radicals. 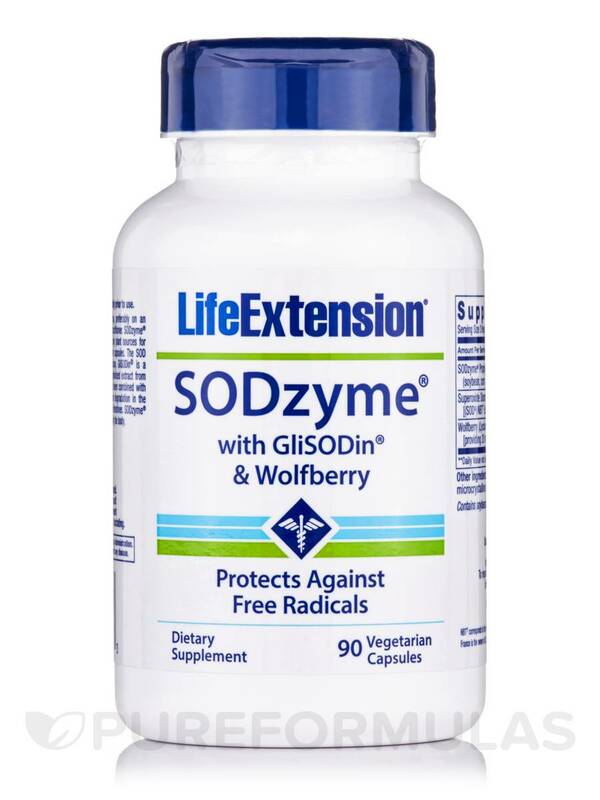 Boosting superoxide dismutase and catalase production in the body‚ SODzyme® with GliSODin® & Wolfberry - 90 Vegetarian Capsules from Life Extension® may guard you against infections. Other ingredients: vegetarian cellulose (capsule)‚ maltodextrin‚ microcrystalline cellulose‚ vegetable stearate‚ silica. NBT† corresponds to the melon extract quantity inhibiting 50% of NitroBlue Tetrazolium reduction. Isocell SA‚ France is the owner of US Patents Nos. 6‚045‚809 and 6‚426‚068B1 and registered trademark of GliSODin®. Take three capsules early in the day‚ preferably on an empty stomach‚ or as recommended by a healthcare practitioner. Keep out of reach of children. Do not exceed recommended dose. Do not purchase if outer seal is broken or damaged. When using nutritional supplements‚ please consult with your physician if you are undergoing treatment for a medical condition or if you are pregnant or lactating.